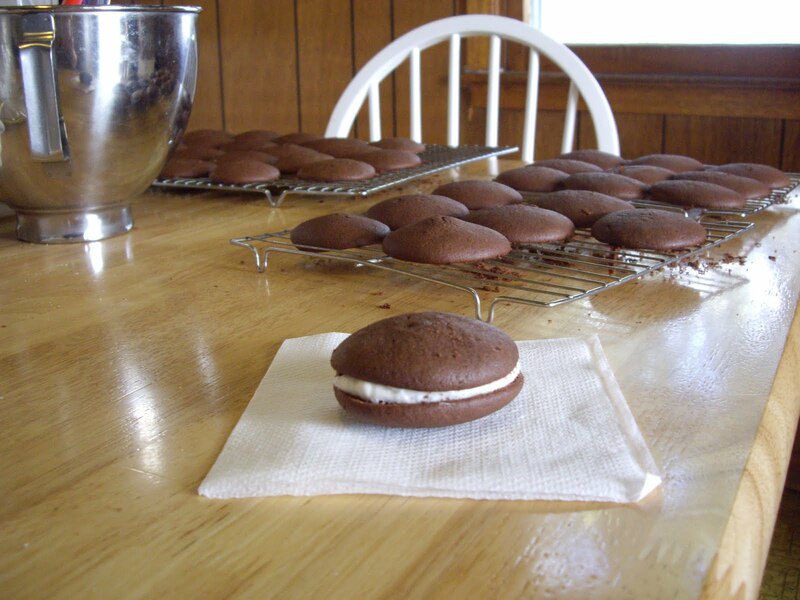 Whoopie pies are two soft chocolate cookies sandwiched together with a creamy vanilla filling. The cookie dough may seem more like a cake batter, but that is the way it is supposed to be. You will need a large bowl for your cookie dough. You will also need a second bowl for the filling. You will need cookie sheets. Cream the shortening and sugar together. Add the cocoa powder and the eggs, egg yolks, and hot water. Add the flour, baking soda, baking powder, salt and sour milk and beat in until smooth. With a spoon or medium size cookie scoop, drop cookies onto cookie sheets. Try and put even numbers on each sheet so you will know you will not end up with an odd number of cookies. Bake in the preheated oven for 10 minutes. Remove to a rack to cool. While they cool, make your filling. Beat together the egg whites, flour, milk, vanilla extract, 2 Tablespoons powdered sugar and the shortening. It won’t get really smooth and that’s OK. Beat in the remaining powdered sugar until the filling is very creamy. To assemble, spread the filling on the flat side of one cookie. Take another cookie and put it flat side against the filling to make a sandwich. You will end up with about 34 good size whoopie pies. Maybe more, if you make them smaller. To store them, make sure to put a paper towel in between each layer to prevent sticking. SO GOOD YOU CAN'T EAT JUST ONE!